Press Representative and candidate mayor for Athens, Ilias Kasidiaris. You could argue that Golden Dawn's theories regarding the involvement of the Zionist occupational government in the prosecution of our Party were simply theories. 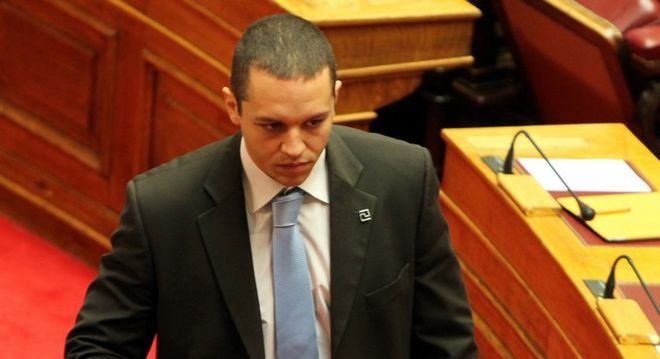 Golden Dawn's press representative and Athens mayor candidate, Ilias Kasidiaris, released online the confession of the Secretary of State, Panos Baltakos, that proves once and for all that Golden Dawn isn't trying to save face, but is in fact a big threat for the System. In the following video, he confesses that he knew that the Prime Minister, Antonis Samaras, the Minister of Civilian Protection, Nikos Dendias, and the Minister of Justice, Haralambos Athanasiou, were meeting and discussing the plot they would/have already set up against Golden Dawn. The confession was recorded by a secret camera Ilias Kasidiaris had with him. Among the things he confesses, he says that he witnessed the Minister of Justice saying to the Prime Minister: "With all the things we are going to do to them, they will barely poll at 2%". When Kasidiaris asks him to testify about the scandalous involvement of the government with the justice system, the Secretary refuses. After the video was leaked, the Secretary of State filed his resignation. Way to go!!!!!!!!!!! Keep it up!!!!!!! Long Live Hellas my Greek brothers! Greeks! If you rise up to overthrow this CORRUPT, PUPPET EU REGIME, your Serb brothers in Christ will ride to aid you! We will help you end these abominations before God, and punish them in the Biblical tradition! Sadly white nationalist groups in America will never make these accomplishments.